If you want to know why customers leave and how to win them back, you’re in the right place. Our guest this week is David Avrin, a customer experience and marketing keynote speaker, consultant, and author, whose most recent book is Why Customers Leave and How to Win Them Back: 24 Reasons People are Leaving You for Competitors, and How to Win Them Back. Listen to The Customer Experience Podcast in iTunes, Spotify, Google Play, Libsyn, Stitcher, and Sound Cloud. We’ll also embed each conversation into episode-by-episode blog posts like this one. Avrin’s latest book examines 24 reasons that people get frustrated with companies. In almost every case it’s inadvertent on the part of the company. They’re not intending to frustrate or annoy their customers, they’re just trying to be efficient or predictable in terms of their behavior. For example, how employees respond to unique customer scenarios that are outliers that maybe aren’t part of their training is really important. If a diner asks to have shrimp substituted for chicken but the restaurant has a “no substitutions” policy, that customer very well may post a very negative review. Across many industries, staff needs to be trained and empowered to make changes to make customers happy (within reason). Even if you have to charge a premium, the customer is likely to pay it gladly. Since the advent of the iPhone 11 years ago, everyone’s become increasingly acclimated to instant gratification. The problem today is that every failure in customer experience becomes magnified because every person you encounter is armed with a video camera on their phone. Everyone is on camera. Everything is being recorded. Everything is being shared. People feel it’s not only the right, but it’s their responsibility to go online and rant about any slight or infraction. Unfortunately, most companies haven’t adapted to this faster pace. Only 15% of companies have adopted an always-on business model to accommodate their always-connected customers. Rightly or not, people expect an immediate response. The problem with this immediacy is that someone’s instant reaction or comments are carved into the permanent granite of the internet. Many business leaders don’t take such negative comments as seriously as they should. For Avrin, at the end of the day it’s about competitive advantage. But that competitive advantage has to be lasting. Great customer experience is about managing expectations. Wow moments are shared more than others precisely because they are extraordinary. Wow moments are episodic but a well-designed, well-executed, well-reinforced customer experience program is persistent. It is predictable. Both customer experiences can be valuable, but one is sustainable. David and his team consistently rely on simple, personal videos in place of some of the plain, typed-out text they might otherwise send to communicate, connect, and convert. This post is based on an interview with David Avrin, author and custoer experience and marketing keynote speaker. To hear this episode, and many more like it, you can subscribe to The Customer Experience Podcast. You can contact David Avrin on LinkedIn, YouTube, Twitter, or his website. Just a minute of your time really helps the podcast! If you don’t use iTunes or Apple Podcasts, you can listen to episodes on Spotify, Google Play, Libsyn, Stitcher, or SoundCloud. Increase conversion and improve customer experience with simple, personal videos. Like David, you have the opportunity to get face to face with more people more often. You have the opportunity to have people feel like they know you before they ever meet you. You have the opportunity to accelerate the sales process and improve customer experience. And all it takes is a webcam or smartphone. It’s easy to do once you know how to do it. Your definitive guide better business communication is available right now for individual or bulk orders. 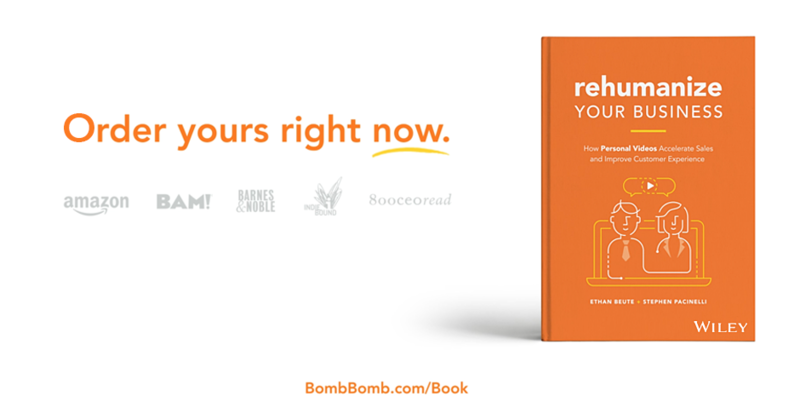 See the video, read advance praise, and learn what you’ll get inside the book by visiting BombBomb.com/Book.